Ham and Egg Fried Rice Recipe is quick and easy to cook, ideal for left over rice and ham. It will make your boring left-over rice into something exciting, vibrant and delicious. The green peas and carrots add flecks of color, crunch and healthy nutrients. Here are some of the Filipino dishes that goes well with Ham and Egg Fried Rice, Max’ Style Fried Chicken, Embutido Recipe, Ginisang Corned Beef Recipe, Pork Tocino Recipe, Tortang Corned Beef Recipe, Beef Tapa Recipe and Skinless Longganisa Recipe. 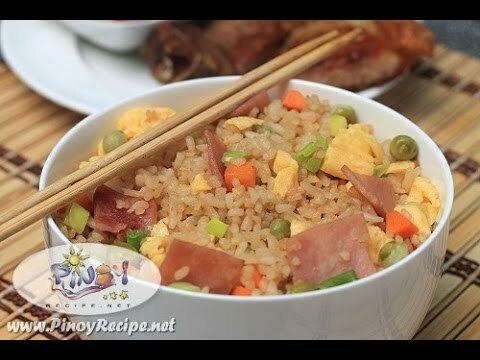 Please don’t forget to watch the video and give this ham and egg fried rice a try, you and your family will surely love it. Heat a wok or a small frying pan over high heat. Add 1 tablespoon Canola oil, swirl to coat the pan. Add eggs and scramble them, once cooked place into a bowl and break them into small bits. Heat the wok or a large frying pan and add 2 tablespoon Canola oil. Add the ham and cook for 3 minutes. Add the carrots and green peas and cook for another 3 minutes. Add the soy sauce then add the oyster sauce, toss to mix in the ingredients. Allow the mixture to heat through, about 30 seconds. Add the scrambled eggs and scallions and toss to combine. Mix well for another 15 seconds then place in a bowl and serve hot. Ham and Egg Fried Rice Recipe is quick and easy to cook, it will make your left-over rice into something exciting, vibrant and delicious. Good flavors in this dish. Thanks. Delicious! This is easy enough for a great week night meal. Thank you for sharing. My family would love this meal. I love fired rice This looks so good!! Thank you for sharing the recipe. It looks delicious and so easy to make too. Fried rice is one of my favorite dishes, I am craving it now! This looks delicious. We could eat this anytime. Thank you for the recipe. This looks like a yummy dish that my family will give a thumbs up to!! Rice, ham & eggs…Every filipina mother (& fathers) has her own variation. Every time I’m eating this while my american friends are around, I end up going hungry because they are eating it all!!! Also, they all end up making it themselves!!!! That’s a great way to use up leftovers. Good flavors in this dish. I’m a sucker for fried rice and this looks like no exception. Looks so yummy. I will have to make this.